“Got a good brownie recipe?” my sister asked. “Oh, two or three,”, I replied. Brownies are chocolate –a life necessity. What did she mean, did I have “a” brownie recipe? So here is take one: Classic Naked Brownie. This brownie has a rich chocolate flavor, not too sweet and just the right texture. Texture is the key characteristic of any brownie. Some people like dense fudgy brownies, others like a less dense, more cake-like texture, still others want chewy middles or crispy edges. All brownies have five basic ingredients: Chocolate, butter, sugar, flour and eggs. Varying the amounts of chocolate, butter, sugar, and flour will affect the texture of the brownie. That’s not to say eggs are not important. Most recipes are intended for large eggs, whether they are specified that way or not. All I had were medium eggs that were definitely on the small end of the medium spectrum. (Great sale price though!) How did I make sure that I used the right number of eggs? I know that eggs will translate one to one from large to medium until after the number of required eggs is greater than three. Then you add one extra medium egg for each large egg specified. Four large eggs needs five medium eggs for the right eggy amount. Five large eggs is the equivalent of 6 medium eggs and six large eggs is the equivalent of 7 medium eggs. Whatever kind of brownie you choose, it is key to not overbake. Test at the least amount of time given, using a toothpick inserted near the middle. The toothpick should come out moist but clean (no crumbs or batter). The edges of the brownie should be just separating from the sides and just barely beginning to crisp. This particular recipe bakes at 325F degrees – a bit lower than the usual temperature – for a longer period of time than most. I find it helpful to note on any recipe you might make again, the exact amount of time it takes YOUR oven to produce the best brownie. Another key is to not overmix the batter. Eggs need to be mixed until no longer visible and “don’t whump it”, as my mother would say. Fold flour in gently until no white is showing and then get that delicious batter in the prepared baking pan pronto. Prepare pan by spraying with cooking spray OR wiping pan with butter. Another alternative is to line the pan with aluminum foil, lightly greased, or parchment paper with 2 inches overhanging on each end. This allows you to lift cooled brownies from pan for slicing or freezing. Bytes and Wheels had a great time testing the brownies for this short series! They want you to know they take their job seriously!! 🙂 No matter how many batches they have to eat in a week – just so I have pictures for you (and my sister). 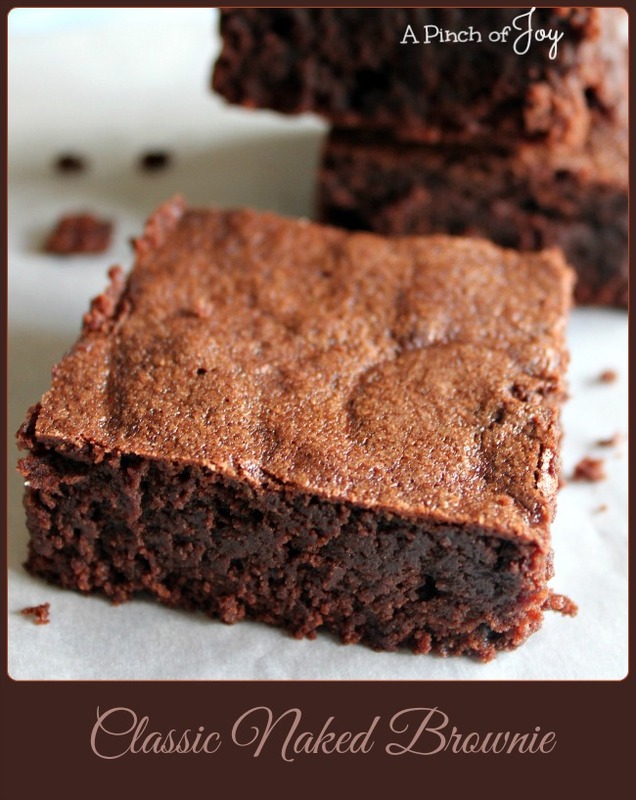 Classic Naked Brownie with a rich chocolate flavor, not too sweet and just the right texture. No toppings, no addins -- just a great brownie! Preheat the oven to 325F. NOTE: temperature is lower than usually required therefore baking time is longer. Prepare 9x13” pan by spraying with cooking spray OR wiping pan with butter. Melt butter in microwave, one minute on high or until completely melted. Pour into large mixing bowl and whisk in cocoa powder with wire whisk until smooth, about 1 minute. Stir in sugar and salt. Add vanilla extract and check temperate of mixture with tip of finger to make sure it is cooled. If it is tepid, add about half the eggs and stir until just mixed. Add the remainder of eggs and mix again. Shake flour over the entire surface of the brownie mixture. Stir gently with rubber spatula or large wooden spoon until just mixed. Pour into prepared pan and bake at 325F for 35 to 40 minutes. Check with toothpick at 35 minutes. Do not overbake.